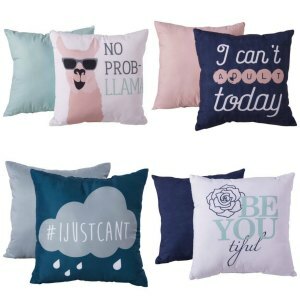 Tiffany's Online Finds and Deals: Cute 16x16 Decor pillow 2 packs ONLY $5! Cute 16x16 Decor pillow 2 packs ONLY $5! Walmart currently has these cute 16X16 decor pillows on clearance for ONLY $5! Free store pickup or free shipping on $35+ orders. There are about 8 to choose from! Theses Mainstays 2-Piece Throw Pillow Sets are the perfect addition to your room in your home, dorm room or apartment! Theses phrases are a fun and trendy add to spice up your bedroom. Each set comes with one Phrase pillow and one solid color pillow. Set includes: Phrase pillow and one solid color pillow.